and Chhatrapati Shivaji Maharaja Hospital. Interested candidates may send their application form along with attested copies trough email to dean@thanecity.gov.in for Attendant jobs and for all other posts recruitment@thanecity.gov.in. For Attendant jobs last date to reach the email along with all documents scanned copies is 24-11-2017 and for all other posts 15-11-2017. 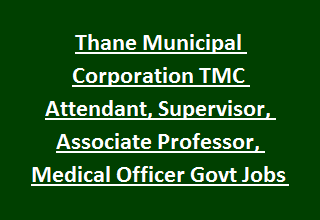 Total 46 vacancies available In this Thane Municipal Corporation Recruitment 2017. For Attendant post candidate must have qualified 10th class and should have experience in Post Mortem work. Candidate will be selected based on their previous work experience and qualifying exam marks. Candidates who are having the necessary qualification they can send their scanned filled application form and scanned copies of supporting documents of attested through email to Thane Municipal Corporation. No other mode of application will be accepted. For Attendant jobs dean@thanecity.gov.in and for all other posts recruitment@thanecity.gov.in. Download Application form for Professor, Associate Professor, Supervisor, Medical Officer and Medical Superintendent Jobs.